The Hungarian jazz guitarist, composer and arranger, Gábor Gadó, despite his quality, hasn't exactly been a prolific recording artist in recent years. Since 2008, he has only released one album, Ungrund, which featured saxophonist Dave Liebman and Gadó's quartet. This new CD shows that his time away from the recording studio has not been unfruitful. He continues to reflect the influence of Baroque music, in particular that of Johann Sebastian Bach. His music is highly personal, even mystical. For this album, recorded in Brussels in early March, 2017, he is joined by the Belgian trumpeter, Laurent Blondiau, who first met Gadó back in 2004. Both musicians have won the prestigious European Prize from the Jazz Academy in France: Gadó in 2003, Blondiau in 2009. The trumpet and fluegelhorn player has featured on over 50 albums, and has an eclectic taste in musical collaborations, which include those featuring Gnawa (North African) musicians. His tone and range, is impressive, too, evoking styles as diverse as those of Cootie Williams and Kenny Wheeler. All ten tracks here are compositions by Gadó. Initially, I wondered whether the track, Mahler-Strauss Memorial, referred to an actual structure. It appears not! It is the close friendship between the composers Richard Strauss and Gustav Mahler, which this piece celebrates. 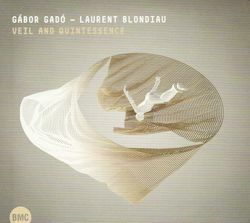 A fine tribute it is, with Gadó coaxing from his guitar the sonorities of an organ and Blondiau's soft and fervent explorations also impressing. The concluding track, Anywhere out of the world - Conclusion Trinité (short version), is another winner. Anywhere out of the world is measured, stately and absorbing. A distinct gap follows before the baroque- inspired Conclusion Trinité can be heard. It is both technically and emotionally satisfying. The liner notes tell us that Ombra adorata was an expression used by the Basque philosopher, Miguel de Unamuno. Gadó interprets it as relating to 'the acceptance of the dark side of things [and] the duality between dark and light that merges into a single superior entity.' Make of that what you will, the opening track is replete with a solemn beauty. There's a kind of meditative melancholy about it which reminds me of the work of Norwegian jazz musician and composer Christian Wallumrod. Kenpo is intricate, oriental in flavour and full of interest, not least for the extraordinary organ-like sounds that Gadó manages to produce from his guitar. Bunan-Icon has several lovely passages where fluegelhorn and guitar are in perfect step as well providing Blondiau with the opportunity for some extended improvisations. Veil and Quintessence and Sacre, the latter more discursive than much on the album, were a shade disappointing but not without merit. The two musicians weave creative patterns of sound in the more uptempo Ebène and contribute probing trumpet and mellow guitar to the Bach-inspiredLittle Protestant Jazz Song. The all-too-brief Chanson has a certain charm about it and goes with a swing. There's no doubt that Gadó has been influenced as a player by some of the jazz guitar greats of recent times yet he manages to put a distinctive stamp on his music, a product of the diverse sources of inspiration he draws upon. There is, dare I say it, a spiritual dimension to his work and in Blondiau he has a fitting musical partner as he continues his quest for a more complete expression of all he feels, knows and is. This album represents a welcome and satisfying return to recording by a European artiste of both talent and imagination.